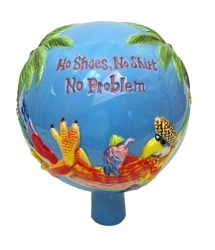 Garden Globe - No Shoes, No Shirt, No Prob - Unique addition to your indoor or outdoor garden areas. Ceramic. Measures 7.75" x 6.5". Gift boxed.